AKA how to style the official color of 2018. Spring is almost here and I can’t begin to tell you how excited I am to wear bright colors again! It seems that this winter has been especially long. For those of us on the East Coast, we’re even getting a blizzard today. But rest assured, Spring is on the way and with it comes a slew of bright, bold fashion colors. One color in particular was all over the runways at the most recent fashion weeks: Yellow was a designer darling, showing up in countless looks. Based on its fashion week appearance, the color will be everywhere this year — I’ve already seen yellow popping up in stores. 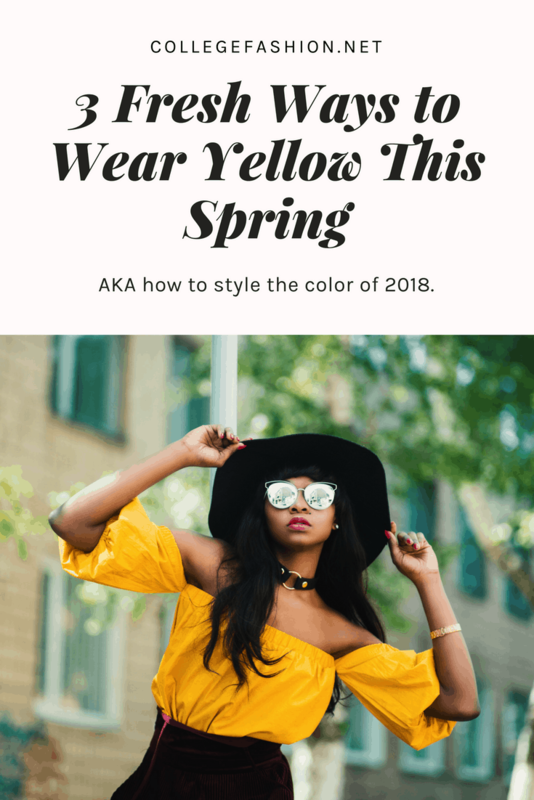 Despite its beauty, I’m sure we can all relate to what I like to call the “yellow dilemma.” Yellow is a vibrant color that’s perfect for Spring and Summer, but nevertheless it presents its styling challenges. 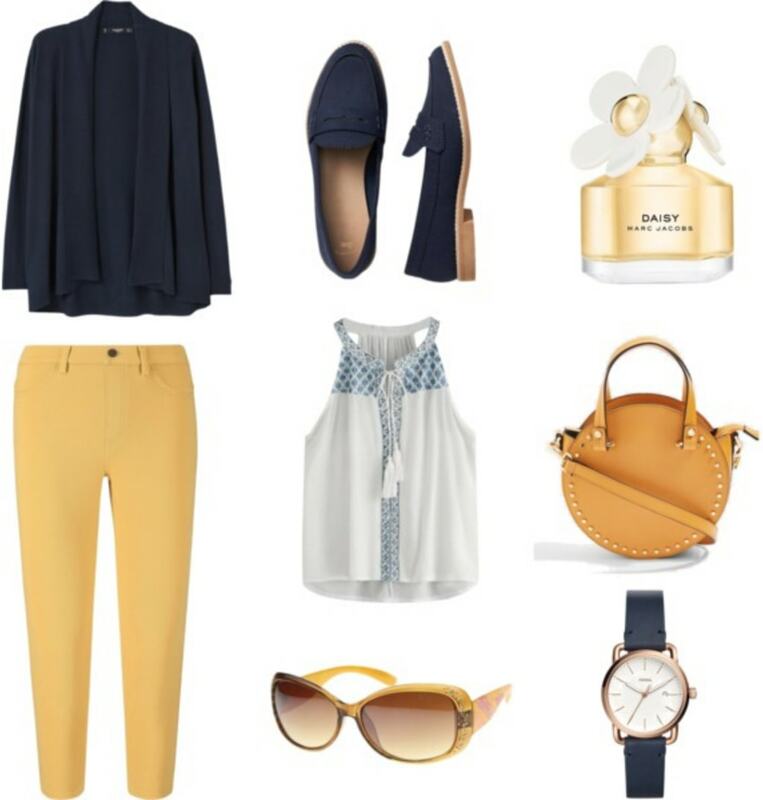 It’s often hard to find flattering pieces in yellow and even more difficult to create outfits that match. My favorite shade of yellow is definitely mustard. It’s elegant and dignified yet still provides an exciting splash of color in your outfit. This outfit is perfect for going to class or simply running errands around campus. It’s stylish but also incredibly comfortable. I love Uniqlo legging pants. They have a great fit and are very flattering but are also comfortable and can be worn throughout the day for a wide range of occasions. I also adore the cardigan because it can be easily dressed up or down depending on the outfit. It’s one of those classic pieces every woman needs. The top is cute and playful, and even though we are just in Spring for now, it could be easily worn in the Summer as well. The shoes and accessories really bring the look together and help make the outfit pop! Let’s be honest, who doesn’t Daisy by Marc Jacobs? The scent is nothing if not the definition of all we love about Spring! Yellow for an evening look? Yes please! This is the perfect outfit for a night out in the Spring. The color scheme still has some darker vibes but it is playful and elegant. Whether you’re going out with friends or on a date with that special someone, this look will have you looking gorgeous! I’m guilty of an avid headband obsession so when I saw this STUNNING piece from Badgley Mischka I instantly fell in love. It pairs beautifully with the other mustard pieces like the skirt and bag. I also adore the scarf. It is a bright shade of yellow in a beautiful cashmere and silk fabric that brings a much needed pop to the outfit! I also really enjoyed the black pieces. The espadrilles are classic and can be dressed up or down. They’re comfortable and one of the must-have shoe styles for Spring and Summer. The top is truly one for all seasons — if worn with a cardigan or jacket, it works for Winter, but on its own it’s perfect for warmer temperatures. Now it’s time for finishing touches. The bee phone case is so darling and reminds of all the critters that arrive with this exciting new season! The perfume and lipstick are classics that will bring a sophisticated touch to an already glamorous look. Whether you’re going for brunch with friends or perhaps on an afternoon date, this outfit is playful and chic. The combination of yellow and purple is truly a daring one. Nevertheless, this outfit manages to do the job! Unlike the first two looks which were mostly mustard, this one’s shades are more bright and vibrant. It makes me excited to think that warm weather is on the way. This outfit is like a little piece of sunshine! I love the dress because, like many of my other favorite pieces, it can be dressed up or down and worn for seasons to come. This is truly one of the qualities I look for when shopping for myself – quality over quantity, guys! I completely fell in love with the lavender shade of the pumps. It’s so feminine and elegant and matches perfectly with the satchel, sunglasses and nail polish. Finally, the phone case brings out that bright yellow I love so much because it is sunny and happy. Did this article adequately teach you how to wear yellow? How do you feel about yellow? What’s your favorite shade? What are your favorite spring trends? How do you feel about pieces that can be dressed up and down? Start the convo below.